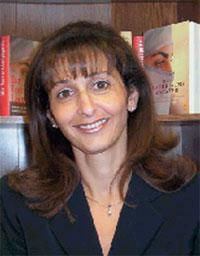 Rita Katz (born 1963) is an Israeli-American terrorism expert formerly of the Investigative Project. She is co-founder of the SITE Institute with Josh Devon which she re-launched in 2008 as the SITE Intelligence Group. In Israel the family settled in a small seaside town called Bat-Yam. Katz served in the Israel Defence Forces after high school, and studied politics and history at Tel Aviv University where she met her husband who was a Russian-Israeli medical student at the university. After graduating Katz joined her mother’s business, manufacturing and selling clothes to Orthodox Jews. As a committed Zionist Katz was reluctant to ever leave Israel saying, “I believed that Jews belong in Israel”. Nevertheless in 1997 Katz’s husband was offered a research fellowship in endocrinology at the National Institutes of Health and they moved to Washington. Katz has acknowledged that at this time she worked in violation of the provisions of her visa. This was disclosed whilst she was acting as a witness against a defendant accused amongst other things of visa fraud. Katz says she starting working in terrorism research by chance. She was bored in Washington and looking for a job and she responded to a newspaper advert placed by the Investigative Project which was looking for an Arabic speaking research assistant. At the Investigative Project Katz was initially told by its Director Steve Emerson that her job would involve a lot of “administrative stuff and copying”. However, she would became involved in undercover investigations of Arab-American organisations and would later be referred to as the Research Director at the organisation. She would attend events “where non-Muslims would stand out” where she “pretended to be the wife of a radical Iraqi-American businessman”. She has said in an interview that she sometimes felt sympathy when “various people told sob stories about how they were abused because they were Muslims or Arabs”. Katz’s earliest exposé was of the Holy Land Foundation for Relief and Development (HLF). She said the investigation began “on [her] own initiative and quite accidentally”. She says she noticed differences between the Arabic and English translations of the group’s literature, and noted that the latter had omitted mentions of groups affiliated with Hamas. She says she “went to a fundraiser of theirs dressed as a Muslim woman. Soon thereafter I was attending conferences, visiting mosques, participating in rallies — and the more I did, the more I discovered the enormity of the problem of radicalism on U.S. soil.” In late 2001 President Bush announced he was freezing the charity’s assets saying that Hamas had “obtained much of the money it pays for murder abroad right here in the United States.” The government subsequently prosecuted the leaders of the Foundation but did not allege that it paid directly for terrorist attacks - rather that, to quote the New York Times, “it supported terrorism by sending more than $12 million to charitable groups, known as zakat committees, which build hospitals and feed the poor. The US government failed to bring a conviction when the case came to trial in 2007. In 2000 Katz recorded Muslim lobbyist Abdurahman al-Amoudi at a public rally stating his support for Hamas and Hezbollah. She released the recording to the media, ending Abdurahman al-Amoudi’s access to the Clinton White House. The New Yorker implies that Katz and Steve Emerson had some sort of falling out, writing that by June 2002 “Katz and Emerson, both combative personalities, had parted ways”. That year Katz left the Investigative Project and established her own organisation SITE with fellow Investigative Project employee Josh Devon. The New Yorker states that Evan Kohlmann also left the Investigative Project with Katz and Devon but this seems to be contradicted by continued references to Kohlmann's role at the Investigative Project as well as testimony Kohlmann has given in court. SITE’s stated purpose was to “educate and aid the public, media and government as to the existence and dangers of international terrorism”. It monitored postings on Islamic websites and emailed information to subscribers. It was re-launched in 2008 as the SITE Intelligence Group. Katz worked with the FBI on an investigation which led to a series of raids in March 2002 in Northern Virginia. The search warrants targeted the Graduate School of Islamic Thought and Social Sciences (GSITSS) and the International Institute of Islamic Thought (IIIT), an Islamic research institute and think tank, as well as the private homes of a number of their employees and scholars. One of the raids led to a civil liberty complaint against Rita Katz and David Kane (the FBI agent who signed the search warrant affidavit). The complainants were Aysha Nudrat Unus and Hanaa Unus the wife and daughter respectively of an employee of IIIT whose home was raided. They alleged amongst other things that the affidavit in support of the search warrants contained fabricated material facts regarding non-existent overseas transactions. The lawsuit was dismissed on the ground that probable cause existed to support the underlying search warrants, and the court awarded attorneys fees to Rita Katz. After the publishing of Katz’s book the Jewish newspaper Forward quoted two anonymous sources “privy to the investigations” as saying that “Katz had exaggerated her role in the Virginia investigation, drawn some reckless conclusions and lost the trust of some investigators from the FBI and Justice Department”. In Al Rajhi v. Wall Street Journal the Saudi bank Al-Rajhi brought a libel case against The Wall Street Journal for its front page article headed ‘Saudi Officials Monitor Certain Bank Accounts: Focus Is On Those With Potential Terrorist Ties’. In that article the paper had stated that accounts at the bank “belong to legitimate entities and businessmen who may in the past have had an association with institutions suspected of terrorism”. The case was brought in England because of the libel laws are unusually favourable to claimants in comparison with the United States and other European countries. The Wall Street Journal applied for permission to plead justification (i.e. that the libellous claims they made were true), and called Katz, as well as fellow terror expert Jean-Charles Brisard, to testify that their accusations were true. In 2004, Katz spent several months helping the Department of Justice prepare a case against Sami Omar al-Hussayen a doctoral student at the University of Idaho in Moscow, Idaho. Al-Hussayen was charged with supplying material support to a terrorist group because he volunteered to setup and maintain a website for the Islamic Assembly of North America (IANA), a group that has been investigated by the Federal Government, but never charged. Al-Hussayen was detained for 1 1/2 years before his trial in which the jury acquitted him on all terrorist-related charges, two of the immigration charges and hung on the immigration charges. The government alleged that he was guilty of immigration violations because he had worked as a volunteer as IANA webmaster, and may have received $300 for this work spread out over multiple years. In May 2003 Katz published an anonymous semi-autobiography entitled Terrorist Hunter: The Extraordinary Story of a Woman who Went Undercover to Infiltrate the Radical Islamic Groups Operating in America. She appeared in disguise on the American television show 60 Minutes to promote her book using the pseudonym Sarah, and wearing a wig and a fake nose. In her book Katz accused The Heritage Education Trust and the Safa Foundation, two north Virginia-based charities, of being sponsors of Al Qaeda. She also accused a Georgia based poultry company Mar-Jac of laundering money for al Qaeda, Hamas and Islamic Jihad. These accusations were repeated on 60 Minutes. Following the broadcast the two charities brought a lawsuit against Katz and CBS as well as its correspondent Bob Simon for slander and libel. The poultry company Mar-Jac bought a separate case in the district court in Gainesville. Katz then broke her anonymity saying that most people who might pose a threat to her as a result of the book knew who she was anyway. Nancy Luque, the Washington based attorney for the two charities claimed that Katz had a personal interest in making the claims, noting that she is a paid consultant for Motley-Rice which filed a $1 trillion lawsuit on behalf of families of the victims of the September 11 attacks. Rita Katz and James Mitre, ‘Collaborating Financiers of Terror’, Monday, National Review Online, 16 December 2002. ↑ Aaron Leibel Author Infiltrates Islamic Terror Cells' Washington Jewish Week 29 August 2003. This page was last modified on 7 May 2015, at 03:32.